Kim Kardashian West told Alice Marie Johnson in an emotional phone call on Wednesday that she would be freed from prison that same day. President Donald Trump granted Johnson a commutation for the life sentence she has been serving for non-violent drug offenses. “The phone call I just had with Alice will forever be one of my best memories,” Kardashian West tweeted. When Alice Marie Johnson discovered that she would walk out of prison on Wednesday instead of spending the rest of her life behind bars, it was Kim Kardashian West who gave her the news in a surreal phone call. 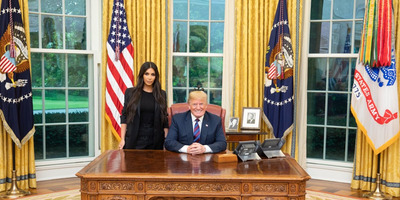 President Donald Trump granted Johnson clemency on Wednesday, one week after he met in the Oval Office with Kardashian West, who for months has championed the 63-year-old grandmother’s case. Kardashian West tweeted that Johnson had screamed and cried when she received the news. “The phone call I just had with Alice will forever be one of my best memories. Telling her for the first time and hearing her screams while crying together is a moment I will never forget,” she tweeted. Kardashian West’s attorney Shawn Holley told Business Insider in a statement that Johnson’s family members later joined the emotional conference call. Johnson was sentenced to life in prison over non-violent drug offenses she committed in the 1990s. She has since been held up as an extreme example of harsh mandatory-minimum sentencing that emerged in the 1980s and 90s to punish drug crimes. She has also been hailed for her volunteer work and exemplary conduct in prison – Johnson is an ordained minister, a playwright, a mentor, a counselor, a tutor, and a companion for inmates who are suicidal, and she didn’t commit a single disciplinary infraction in two decades in prison, according to prison documents. One of Johnson’s daughters, Tretessa Johnson, told Business Insider that her mother was “in tears” throughout their call on Wednesday. Tretessa also said her mother has previously indicated she wants to use her freedom to advocate for sentencing reform and become a mentor to other women released from prison. She added that she knew many other people in similar situations to her mother, and she hoped they would receive similar attention. Kardashian West indicated in a tweet on Wednesday that she intends to do exactly that. “I hope to continue this important work by working together with organisations who have been fighting this fight for much longer than I have and deserve the recognition,” she said.